Brief Synopsis: "Brave is set in the mystical Scottish Highlands, where Mérida is the princess of a kingdom ruled by King Fergus and Queen Elinor. An unruly daughter and an accomplished archer, Mérida one day defies a sacred custom of the land and inadvertently brings turmoil to the kingdom. In an attempt to set things right, Mérida seeks out an eccentric old Wise Woman and is granted an ill-fated wish. Also figuring into Mérida’s quest — and serving as comic relief — are the kingdom’s three lords: the enormous Lord MacGuffin, the surly Lord Macintosh, and the disagreeable Lord Dingwall." 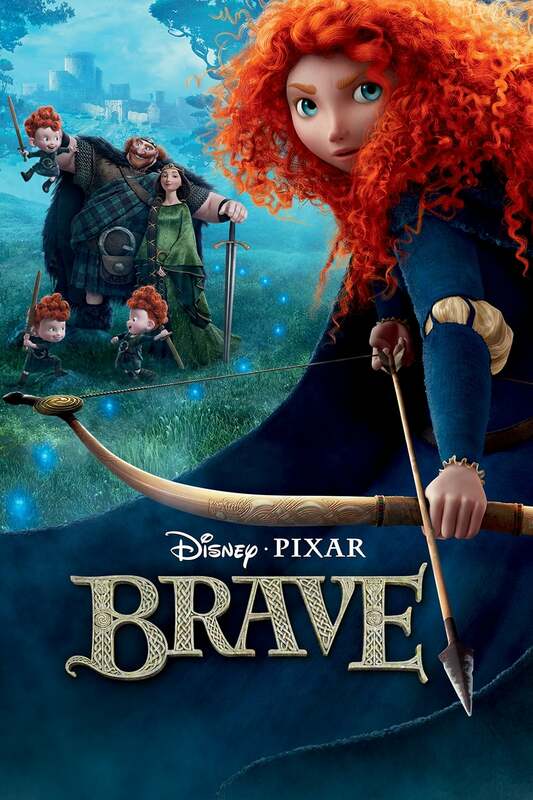 CinemaVisitor Erik 75 - BRAVE (2012) After the disastrous Cars 2 Pixar is back with a very much enjoyable family animation, set in medieval Scotland. Pixar has earned its reputation mainly with the Toy Story trilogy, WALL-E and Up but it is worth mentioning that whatever they have created in the past they always managed to bring quality animations on to the screens not just for children but also for adults. I have always liked their films (apart from Cars and Cars 2) because they are not just beautifully animated but also funny, in some cases emotional and highly entertaining. Now, in 2012, they brought us Brave in which the leading character is a young Scottish princess who is trying to alter her fate by magic but somehow it backfires and it causes trouble for her and her family. The story centers on Merida (Kelly Mcdonald), the daughter of the Scottish king, Fergus, (Billy Connoli) and his wife, Queen Elinor (Emma Thomson). She is not a typical princess who wishes to do nothing but wait for her dream prince to marry her. Instead she spends most of her free time on the back of her horse looking for adventures with her bow the she loves and handles like a pro. There is slight resemblance between her and the heroine of The Hunger Games, Katniss, but I think it is mainly because of the fact that they are both very good at archery. Merida refuses to listen to her mother and learn the etiquette princesses should know, she doesn�t want to get married or be a queen and it creates tension between them. The day of the Highland Games arrives when the first-born sons of the leaders of three Scottish clans are all competing for her hand. In her desperation she seeks The Witch�s (Julie Walters) help to change her destiny but as it always happens things don�t turn out well. One of my main problems with the film is the title. I have never liked films that title is either misleading or doesn�t really reflect the film itself and that is what happened in the case of Brave. Apparently the film was titled The Bear and the Bow previously which I think was more appropriate for the film but for some reason they decided to change it. I suppose they wanted something short and catchy but for me it doesn�t work. I understand the idea behind it, to change your destiny you have to be brave but still� My other problem is the plot itself. It starts very well, we get to know a cool princess who is not the usual blond cutie but an adventurous red-head girl who wants more than that royal blood can afford but half-way through when to story kicks in it turns into a silly story that could have afforded so much more and could have been so much better. I understand that the target audience for this film is mainly children but a bit more real adventure and seriousness would have not hurt. The idea of Queen Elinor turning into a bear due to The Witch�s spell is rather funny but the execution is a bit dull and to be honest nothing much happens apart from the usual awkward situations that we are all accustomed to. Even though the plot is not perfect there some great things that Brave can offer you and make it worthwhile to watch. The animation is breathtaking, vivid colours make the Highland landscapes real, it just made me want to go back to Scotland, hike the mountains and discover the beauty of the country over and over again. I watched it in 3D and this was one of the first times that I felt that it actually added some extra to the visuals. I would also like to highlight the cast who provided the voices of the characters as they managed to handle the Scottish accent very well; it made me smile throughout the film. I am glad they did it; it adds an extra charm to the film. The characters are all loveable and cute, you just adore them while watching and as I said, their presentation might be a bit childish but I loved them regardless. Overall I really did enjoy Brave as it kept me smiling for 100 minutes and even though there are not many lough out loud moments or action in the film it will keep you smiling and entertained which, for me, was more than enough. If you don�t go in hoping for another Up or Toy Story you will come out as a satisfied person who spent a good hour and a half in cinema. Dan O'Neill 70 - Brave definitely has some nice heart, humor, and beautiful visuals to show off, but it�s not Pixar�s best because of a surprising plot twist that takes it right into kiddie material, which wouldn�t be all that bad if it wasn�t any other flick. However, it is Pixar and the bar has been raised a little too high for them to do something like this, and almost get away with.